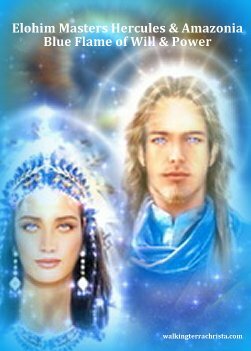 Elohim Masters Hercules & Amazonia, of the Blue Flame of Will & Power, represent the power and essence of strength and walking a pathway of inner balance to fully reflect God’s Will through each of us in Action. We can fully bring forth these elements within our lower aspects of this Ray but to embody it on the Higher level is truly our TRUTH and vulnerability as God-given Beings of Light. Both of these beautiful masters show us how to bring in these essences so that it comes from pureness of our Hearts and I AM Presence. The Elohim walked this Earth during Lemuria so you may even feel very much akin to some of these great Beings we will be sharing with you. It is our Divine Pleasure to come through each of you on this day of your reading and feeling our essences. The first element we ask you to do is breathe deeply and allow the Blue Flame representing strength, courage, and the power of your Will to fully come into your physical creation. Feel your Mental thoughts just being blurred within you as they merge within your Emotional feelings. Allow the Masculine and Feminine to fully blend into the Oneness that You ARE. We give you this visualization to help you realize your Divine Essence in the purest of your Heart. You cannot utilize the Blue Ray of Will and Power until you see the vulnerability that is within you. This is truly a gift and some may think that it is a detriment. The Heart must heal through this process in order for you to see the Will of YOU within You. It is very simple actually. Understand this process in this manner. You are going through a challenge with another person or situation. The first thing you want to do is to tell them, lash out at them in anger or frustration and this is so very wrong. The first element you need to realize is that it is occurring because of lower thoughts, situations, or feelings within you. It is not the other person; they are just assisting you to fully change it and bring it into the Light. Working with the Blue Flame of Will and Power is a very strong force. This is why it is imperative at this time to actualize this flame from the highest frequency and not the lowest. If you are struggling with relationships or feeling powerlessness, we guarantee you that you are still emanating from the Red Flame on the planetary level. We must help you to arise to the Blue but sometimes it needs to be a steady pace and not a jump from one to the other. To read the rest of this article, please see Walking Terra Christa. ©2012 Walking Terra Christa ~ All Rights Reserved. No use without prior written permission allowed. Excerpted from the upcoming book. We are about to experience one of the most powerful times of the year when the moon fully moves into the Harvest season. But the best part of all is that we are also within the most powerful year ~ 2012. As we bring these two elements together, it is going to be a powerhouse of frequency for each of us. The most important part of this full moon is going to be our preparation of our-selves. Whatever we have done up to this point in time is going to allow each of us to grow further in the coming months. Everyone within the awakening stages is very aware that this is a very intense year for each of us and those around us. But what we do not realize is that the preparatory stages are most important for our full expansion into this time of reality. This full moon is in Aires and the sun sign in Libra. They contradict each other as Aries is about expanding and Libra is about finding the balance. But in truth these two elements are going to assist us greatly in the enfoldment of our lives. Many of us tend to run around like chickens without a head trying to prepare for our lives through our work, family, friends, spirituality, and healing of ourselves. Do you do all of these on every day of your life? If you do, then you are way ahead of the game. If you are like most of us, we are trying to pressure ourselves into being within that balance. Then what happens to our emotional feelings and mental thoughts. They do tend to get in the way of not fully acting upon what is right within each moment. So this is the time to take that moment and stop thinking, feeling and just BE. Smell the land around you, stand in the ground with your bare feet, and be one with the entire Universe. This is going to assist each of us more than any other moment of planning, scheduling, and preparing for the future moments. You may still do that but once you stop the merry-go-round, then you can see how deeply you needed these moments of reflection. So how does this all help us with the Harvest at this time of the season? Without knowing ourselves inside, we cannot assist our outer world. The confusion of our lives spills into the other elements and then we cannot create the serenity, peace, and joy we so richly deserve. All the frequencies of this fully moon to take us fully into this month of creation and allow your Spirit to guide you into the next creative process. Take this time to set up a small ceremony for yourself in nature, with any parts of your life that you cherish. It may be a special picture, a crystal or rock, or a poem or decree that makes you feel good. Work with the energies of the Earth, the Fire, the Air, and the Water to assist you. State your intentions of what you need and allow these elements to come to you to assist. Allow the Air to whip away your old aspects that you need to remove, connect with the Fire energy to burn away the emotions and thoughts that do not serve you, speak to the Water to see the fluidness of this moment moving away as new changes will come to you in the circle of life and stand upon the Earth to help you ground the NEW YOU. Utilize a stone to share your intentions and throw it to the wind, into the trees, or in the water around you. Sit by a tree and feel its roots embrace your essence deeply. Utilizing any of these elements will truly assist you in commanding your life to be the Harvest Within. Then walk away with the knowledge of your Higher Self guiding you deeper than you could ever imagine. Feel your steps into the ground giving you’re the strength and courage that you have desired deeply within you. Talk to Grandmother Moon and allow her essence to blend with yours. She is waiting for you to fully embrace your fullness of Light upon the Earth. Feel it grow within you and accept your new-found balance within as you walk with the Light you are fully embodying within yourself. This is a very powerful time and a more powerful season. It is our Divine Right to fully embrace these moments. We have worked hard to arrive at this destination and know that you are special, have a gift to give, and the Universe will support you in this endeavor just by Allowing It To Be. 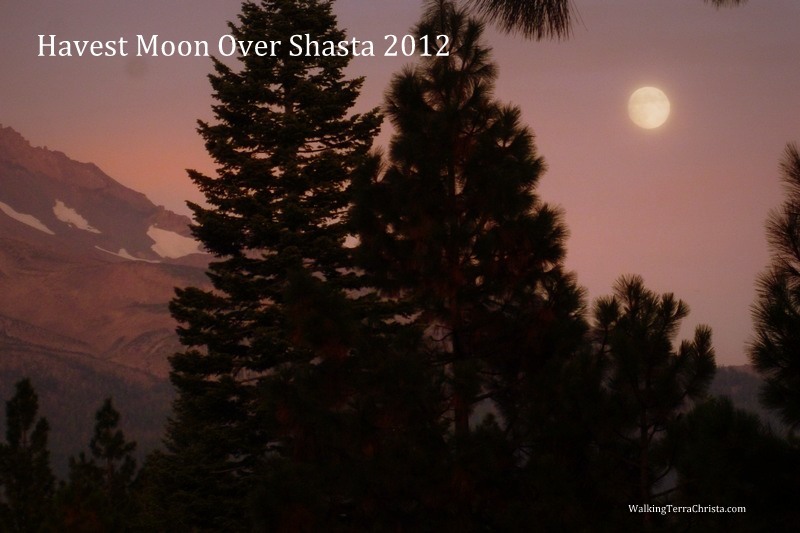 Please join us for a special Harvest Moon Ceremony on Monday evening, 5 PM Pacific as we travel to the Clarion Temple of Oneness and celebrate with the Beings of the Universe. Many blessings for a wonderful Harvest experience. 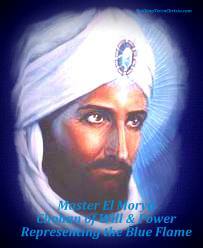 Master El Morya is the Ray Chohan for the Blue Flame of the Ray of Will & Power. This flame is associated with our Throat Chakra in the Universal Level. Working with Master El Morya can be a very life changing experience as from the qualities of this ray an individual may think that his energy would be intense and very strict. He is very powerful but within that power he brings forth a calmness of his Spirit that is so wonderful to experience within your Being. As many of you could relate in reference to teachers we have had in our studies, they do not always share their pure heart. Well, Master El Morya is very strict but within that strictness he shows how to work through the process of ascension and acceleration. Allow him to come to you as you read his words. Take a deep breath and allow him to stand before you to fully feel Who He Truly Is and you will see Yourself reflected within very deeply. Thank you, Dearest One, for your kind words. I believe that many initiates that I have worked with would not have been so kind but I have helped them to move mountains in their own endeavors. They have proved to be the best students as the ones we do not like necessarily affect us the most. It all depends upon the student as they work with the Master. I represent probably one of the most intense frequencies of ray energy available and it turns out to be the first one individuals turn towards. It is the type of individual that is ready to work through their own processes to make the necessary changes that is truly the best relationship for Master and Student. It is the ones that rebel and think they are right when a lesson comes to the surface that causes great discord within the Master. But it happens and later that student, if they are humble enough to do so, should return and thank the Master for that lesson. It has gone both ways for me, by the way. Representing Will and Power is not an easy job but one that I am very diligent in my own pathway. There is nothing more important to me than sharing with individuals how to find their own Freedom and once this is done, it assists the planet immensely. If everyone was obstinate and sure of themselves when they truly had not done the proper homework, then I would not be doing my job. It is a huge position to assist individuals to fully understand that they are part of a greater whole and not all that THEY are doing, is of the utmost importance. We are a team, each of the Ascended Masters, and that means each of you that have acquired this position of standing. It is important for every individual to embody Will and Power from the God Essence and not their emotional or mental bodies. This is where the world gets into trouble and has been for centuries. We are at a place in history when more individuals are awakening upon the planet to assist in making this planet, Earth, that we call GAIA a balanced energy that expresses the essence of God into their Hearts and Minds. So how can we embody Will and Power if the four-body system is still separated from the Essence of God. Some do not think so but it is true. My job is to assist you, as the student to fully understand the process of Will and Power which will create deep understanding, from a perspective of great tolerance and patience. Each of you have something very strong to give to this world; otherwise, you would not be here at this time. But you cannot jump into the cart before the horse is ready to move. Patience, my children, is your friend as it will give you great tolerance in what you are learning. You have a will within you that is great but it cannot be shown to another until you can express it within yourself. Where is this Will coming from ~ your physical mind? If it is, then you are in trouble. If it is coming from your Highest Essence, then you are on the right track but it is a huge learning process as there are many lessons within the initiations and sublevels of trial and error. So we need to start from the beginning of your Creation and allow the Blue Fame to fully embody your essence. Bring it down through your AntakaranaBridge from the Higher Realms like your Higher Self is on a huge sliding board and allow it to slide into your physical body. What does that feel like for you in the physical realm? I bet it feels very powerful but yet flowing. As you express the deepest part of your being into the physical realm it will change elements that you have been trying to combat within yourself. You see, there should not be any arguments happening with you. There is only one way and that way is to fully see yourself as a God Realized Being. This is where your power lies; not in trying to control your situations or people around you. You must take responsibility for yourself completely. Once the Blue Flame embodies within you and sits within your Throat, you are now able to speak from the highest part of your Being. It is when you speak from your physical mind that it gets you into trouble. The mental body is trying to find a way within your world and he thinks he knows best but truly he does not. He must blend with the emotional body and remember there are emotions attached to each of these experiences. When you allow the Blue Flame to be embodied within you, it is like a light bulb that is turned on. It is an AH HAH moment. Yes, now I remember what I am supposed to be doing. Then, at this stage, you start to reflect on your next movement. It comes from the space of your God Essence within and allows the power that is within you to be very diligent but yet with great humility of the journey you have traveled to be where you are. This is where the true Will comes into your awareness. These are the highest aspects of your Being. When you do it any other way, you are definitely allowing the lower mind to take over which creates obstinacy, anger, and arrogance. Allow the Blue Flame of Will and Power to embody within you God’s Essence that is YOU. It is not anyone else, but truly your ability to fully see yourself in the Light and walk from the Old to the New. Create the bridge of your reality into the BEING that you have become. Ask for me and I shall help you walk on this bridge and see that what was before was okay but now it is beautiful and flowing within your existence. ©2012 Walking Terra Christa ~ All Rights Reserved. No use without prior written permission allowed. Excerpted from the upcoming book. To contact us, post a blog comment here or on our http://WalkingTerraChrista.com website. If you want to learn about all the 22 Rays of God – why not take our 22 Rays Challenge and get a Decree and an Audio MP3 Attunement for each of the 22 Rays? Each of the Rays of God are emanated from the Light of the God Force. For the first 12 rays they are sent to each of the Ray Chohans from the 24 Elders That Surround the Throne of Grace. We will be sharing their essence for the first 12 Rays of God. Each of these essences is a component of many energies of formlessness, angelic, inter-galactic, and human so there are many aspects within the Elders that represent all of these frequencies. This is the first time they are sharing their Light with each of us in this manner. 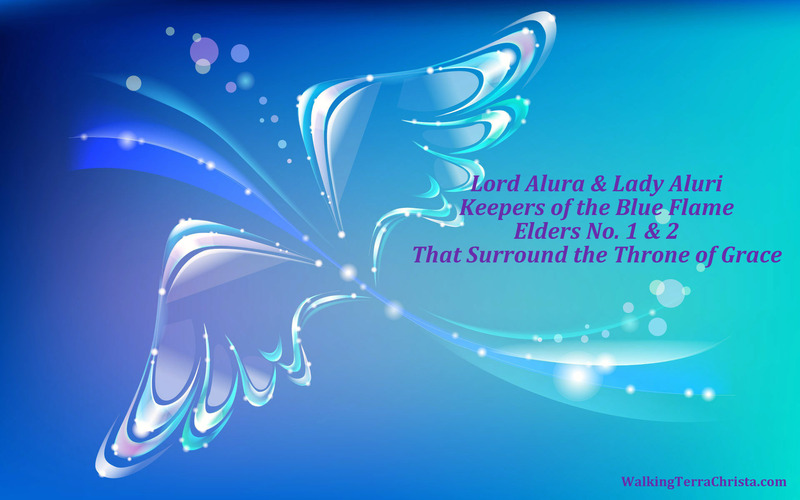 Ray 1 is represented by Lord Alura & Lady Aluri who are considered Elders No. 1 and 2. Their energies bring forth the elements of Humility, Patience, and Strength. It is our pleasure to full allow our Essence to be shown to you through this channel of Light. We house ourselves within the Throne of Grace which truly represents the Divine Mother and Father God in its purest and rawest form. We are a mixture of many energies that have been housed since the Creation of Divine Mother and Father God and represent all elements within the multi-universes in our creation. On this day we would like to express to you the essence of the Blue Flame and how important it is for the Divine Purpose and Will within your structure of the human existence. There is great reflection of the rays of God and as we impart these essences onto the Ray Chohans it is their job to fully command it through them into each of you. They represent the teachers of the Earth in human form; the Archangels represent your angelic presence; and the Elohim represent both aspects. So when we express our energies in this manner, it is all in the completeness of Oneness. We felt it was important to share that element to each of you in helping you to understand exactly how the Spectrums of Light work through the essence of Divine Mother and Father. We as Lord Alura and Lady Aluri embrace the essences of the Divine Will and Power in its highest forms. When you intend to use just the Ray color, then you are accessing our energies. That is why it is important to understand how powerful the rays can be from this level of expression. That is also why we have Ray Chohans, Archangels, and Elohim overlighting each of the rays of God. They are a filtering of that light frequency so that it can get to each individual person in the way that is most suitable through their higher self to the physical creation that you are. We, of the Blue Flame, want each of you to realize that embodying these essences within you are a very important facet of information. That is why the spectrum of light shifted to come into the planetary level so that the frequency was not of the highest but still very strong. What happened in this process is that the flame of the planetary, Red, became encased in the depthness and not the purity of this ray. It has caused great affliction upon the Earth in many individuals as they were not ready to receive the higher aspect of God’s love within them. They wanted to but could not integrate it within the physical body. So we give to you the ability to assimilate the Blue Flame within as to create the balance that is necessary within the body. You already have walked the pathway many times and tried to create what you know is right but have been unable to do so. Working within this ray of light will assist you in fully accessing your own Divine Will and Power. The most important element to remember is that it must come in its own time. Too much of anything will throw you away from your true purpose. 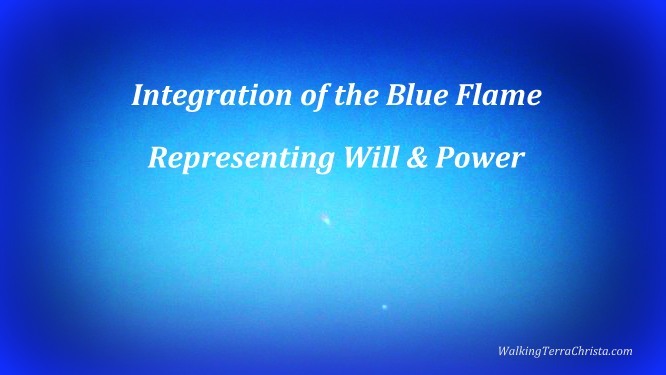 Work within the Blue Flame of Light is fully accepting that you have a role to play within your life to share with others but first must embody it within. This is where it has become very confusing in some areas of reflection of the planetary level. So we give to you today the ability to fully access the Blue Flame from your own highest Essence. Allow this frequency to come to you very slowly but deliberately and you will be able to acquire great patience with the strength that is needed. Do you see that at times you forged ahead too quickly without really knowing what you were doing and thought you had everything in place and then to find there was confusion? This is part of not allowing to sit back and infuse the frequency within until ALL ASPECTS of your Being are ready to receive the courage to move forward. Internally you must allow this ray to embody within your Throat. It already has been in place within your crown so let’s just take a breath and relax into the frequency of the Blue Ray. We embody this to you now. Feel the spiraling lights moving into your Throat and just relaxing the pressure within your body. We give to you the ability to feel differently with the Universal ray of Humility, Patience and to know you are a leader in your own world. But you must first start within first to feel it before you can share it with others. Otherwise, the lower ego and mind takes over and you don’t fully embrace the entirety of the aspect of God’s Will and Power within you. Allow it now to be within all parts of your being and accept your challenges as a learning process of accepting your vulnerability. This accesses your humility of the self to see beyond the problem into the solution of your world. Embracing this light will fully allow you to go slower and with intent that is focused from your Highest Essence into the Divine Being that You Are. We were honored with the presence of Lady Sujata who represents the Venusian Flame of Purity in our 4th class with the Kumaras of the Venusian Rays, “Venus Meets Gaia for Terra Christa”. Working with Lady Sujata is absolutely amazing as she brought forth her essence in an angelic and humanly way of Being. This represents who each of us are embodying at this present time. We share with you her essence within her own words of expression along with a beautiful decree for you to use in your own studies of working with Lady Sujata. If you have an interest in accessing the class downloads and being part of the program including a private session with each of the Kumara Flame Holders, please see our informational page on this amazing seminar which can be started at any time. As I allow her White Light permeate within my Being. As they truly reflect within me my own beauty. I feel the essence of my Being completely new. It moves with the tide just as I have done. I dance along the beach with the essence of my Purity. I embrace all these elements and more. Is now the Purity of God’s Love Within Me. Of a Supreme Being of Light. I AM that I AM that I AM. Lady Sujata comes to us with an essence of great strength and beauty. She spent many timelines as an Angel in different forms during her creation. Her purity of Spirit was not well received at times in the human body. She explains to us how she truly desired to assist individuals to find this essence within them-selves. As she wrote through Meleriessee, she felt the deepness of her heart in this purity. She shares she was a Goddess in Lemuria and her intuition told her she endured great pain at that time. So she shares with us that each of us can remember our truest essence to fully embrace this White Flame of the Purity of God. I bring to you with this flame of the pure white light, the essence of your beginning since the creation of the spark that you are. I have been angelic in many forms which truly is the blessing of this flame. I come to assist in allowing the soul to remember its essence since the beginning of time. Whatever has occurred in between is just the reflection of those moments as we always go back to the essence that we once were. Allow this flame to enfold within your own remembrance, and you shall see a component of yourself that needs to be acknowledged within. I have been the flame holder of the Purity of Light for many earth years and beyond that. I am a reflection of the essence of the Feminine Divine but more than that can be perceived within the mind. In my beginning I represented the snowflakes and allowed my essence to create from the heavens the purest form of energy unto the Earth. I then moved from the element of snow into the angelic presence overlighted by the Cherubim’s. In their essence and purity it was I that was born into the existence upon the heavens as I assisted many to feel their essence and light in a different manner than ever before. I was given the opportunity to grow within my wisdom and come to Earth. I was one of the angels overlighted on the birth of Jesus and was assigned to watch over the family of Jeshua and Mary. I watched over the Holy Grail to shine the light upon the essence and preserve its completeness of the totality of the lineage of the family. It was at this time that I came to Venus to be inducted into the Venusian way of being. I was tired of being an angel. You see that was my second time. I was in a physical body during the Lemurian timeline. That is when I became very involved with the Lady Masters as I worked with them to preserve their heritage. I also assisted the King and Queen of Lemuria to preserve their heritage. At that time I was a Goddess of Light under the direction of Lady Isis. I once again was to serve a timeline that would last between eras of growth. When the Goddesses went into hiding, I went into exile. Sanat Kumara saw my service to the Lady Masters and the work I had done in angelic form. He told me he would keep me safe but there would be lessons that I needed to learn in guarding the secrets. At this time, it became too much for me. I had my fail from Grace. Since my service as a Cherubim, I was allotted the availability to come back to angelic form. I spent many eons of time learning from my mistakes while allowing myself to see my own truth in the situations I encountered. It was then at this time, that I was asked to come to Venus. After my work with the Jeshua and Mary lineage, I was growing tired of watching over and wanted to infuse myself into a life that I could do service with my wisdom but yet experience a form that would serve its purpose. This is when Lord Melchizedek took me under his wing and directed me into his asylum to prepare to be born into the planet of Venus. He said my previous service would be a good adjustment into the Venusian way of being. So I have been on Venus as Sujata for almost 2,000 earth years. I first went as a student of the light due to my angelic form and then I was asked to come to the school of Sanat Kumara. I was told that my work in Lemuria and as the angelic form would be very much needed as groups of Kumaras were working with humans to assist the planet after the fall of Jesus Christ. There needed to be great prayer and understanding to the people of Earth. I was so honored so I stayed and have never left since. Dearest Sanat offered me to go through the Venusian Rays and learn all aspects. He felt that it would help me in my own internal worth that was damaged due to other experiences. I found myself deeply immersed in the Venusian way of life. It took me many years, but eventually I was asked to be the Priestess of the White Flame of Purity. It was not an easy transition but one that I knew I needed to do for the sacredness of my being. It is a beautiful life for me and I have many friends and special moments with everyone. I represent this ray from the deepness of my heart to each of you. I bring forth the Harmony of the Spheres and allow each individual to see their own essence that is very pure no matter what our circumstances may have been. It is my pleasure to walk with you through this journey of the Venusian Rays of God. Accessing the energies of Will and Power can be a very powerful exchange of light. We want each of you to understand how to utilize this ray as on a planetary level it can change your world completely even when you do not want to go to the extremes this ray can embody for each of us. On the Planetary Level the color is Red which correlates with the Crown Chakra. This ray on this level represents Power which can be in its rawest forms. Earth has truly had its powerful leaders that represent this level and we still do as that can represent arrogance, desire to control others, obstinacy, deep pride and ambition. These elements are considered the vices of this ray. When we first worked with these energies many years ago, Meleriessee had a joke about the “red ray types” which we usually find in government positions, executives, military, and politics. Now it does not mean that this has a negative connotation to this ray, but in the lower aspects, it truly does. It does not infer that someone with these qualities cannot aspire to higher levels which is why the Science of the Rays is so fascinating. To read the full article on Walking Terra Christa, click on this link. Join us for the 22 RAY Challenge and receive a Decree & Attunement for all of the Rays of God via your email. 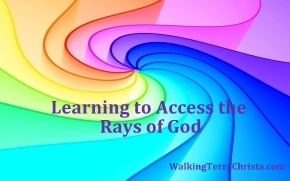 On WalkingTerraChrista.com we will be highlighting each of the Rays of God each week in a daily blog. Each week we will share information on one of the Rays of God in succession by providing the higher aspects, lower aspects, pitfalls, and information to assist an individual to learn how to incorporate them within their daily life. In addition we will provide a short message from each of the overlighting energies within each ray. Each of the first seven rays are overlighted by a Ray Chohan (sometimes more than one), Elohim Masters (Male/Female), and Archangels (Male/Female). Just recently we learned through one of the Etheric cities more detailed information about the 24 Elders That Surround the Throne of Grace who are the commanding energies of the 12 Rays of God. So this has added an extra dimensional frequency to learning more about the rays from the Cosmic Frequencies. We will be providing channeling from each of these beings and informative tools to assist an individual in accessing these rays. It is imperative that we fully command the Rays of God as we walk along the Mastery pathway. For anyone that feels they are a leader and have special gift(s) to share with others for the New Earth, then this is your ticket to going deeper within yourself to assist humanity. We will share with you, the reader, each of the virtues of each ray and the ones that need to be acquired along with specific professional pathways that an individual can choose to take. Included will be the Lower Expression along with the Higher Expression and what the difference may be from the Planetary level to the Universal. It is important to realize that as human beings we come into body with at least six rays within our structure of the Personality, Physical Body, Emotional Body, Mental Body, Soul and Monad. You can have more than one ray in each of these aspects also. So we are already working with the frequencies of each of the rays which is very important. What many individuals do not realize is that in order to be in full mastery an initiate must be able to command the rays, know what they are, how to utilize them personally and professionally. It is a pre-requisite of a 7th dimensional initiate. (Note: you can also learn more about these aspects and which rays you are attuned with by having a Ray Reading with Djwhal Khul and Christine Meleriessee). We are now working with the higher rays beyond the seventh to the 22nd because they are available to each of us within the Earthplane with the higher frequencies that we are accessing. We also work with the Universal Rays vs. the Planetary as the frequencies are higher, and we need to move through the processes to fully accept we are Mutli-Dimensional Beings of Light. Originally, the teachings from Dr. Joshua David Stone shared only the planetary colors and associated chakras. Meleriessee has taken it a step further and channeled more information in how to access the higher frequencies. We, at Walking Terra Christa, only use the Universal colors at this point. During a ray reading she would share with you what stage you are integrating to help you to aspire to the higher levels. The rays beyond the 7th level are considered the Cosmic Rays which we can now access up through 22. This will increase as we move into the New Earth. Each of the higher rays become the higher chakras within the body and is infused within the 3rd dimensional chakras so they become chakras within chakras. Essentially, there are 320 chakras that could be infused at the highest level of initiation. That, of course, is not within the stability of the fifth dimension or beyond. It represents the 49th dimensional frequency. Once the New Earth is fully activated, we will be able to infuse the higher chakras from the 5th onward. The 5th dimensional grid = 22, 6th = 29, 7th = 36, 8th = 43, and 9th = 50. These are the Cosmic Rays that will be attuned to us. Rays 1 through 15 are directed from the 24 Elders That Surround the Throne of Grace who represent the God Force. They send the frequency through each of the Chohans and overlighting Beings that work within that particular ray. We will share on the weekly posts which Elders represent the specific ray energies. #1 Will & Power, Blue-Throat Chakra; Chohan, Chohan-El Morya; Archangels Michael & Faith; Elohim Hercules & Amazonia. #2 Love & Wisdom, Golden Yellow-Crown; Chohan- Master Kuthumi, Ascended Master Djwhal Khul; Archangels Jophiel & Christine; Elohim Apollo & Lumina. #3 Active Intelligence, Pink-Heart; Chohan-Paul the Venetian; Archangels Chamuel & Charity, Elohim Heros & Amora. #4 Balance & Harmony Through Conflict, Crystalline Light-Root; Chohan-Serapis Bey; Archangels Gabriel & Hope; Elohim Purity & Astrea. #5 Scientific Knowledge, White Light Mixed with Green & Gold; Chohan-Master Hilarion; Archangels Mother Mary & Raphael; Elohim Cyclopia & Virginia. #6 Devotion, Ruby Red-Solar Plexus; Chohan-Lord Sananda/Lady Nada; Archangels Uriel & Aurora; Elohim Peace & Aloha. The Mahachohan is head of all of the Rays. This post was being shared by Allah Gobi within Rays 1 through 3 and Saint Germain was overlighting Rays 4 through 7. Saint Germain is now the Mahachohan for all the Rays with Allah Gobi assisting the energies; Lord Maitreya, Office of the Christ also oversees the Rays of God. If you would like to be part of our new amazing program, “22 RAYS Challenge” in which you receive a decree and attunement via your email, please check out the information. We also have a special workshop series we facilitated earlier this year, “Traveling through the Rays of God within the Chakras”. We shared information about the chakras and traveled with the Overlighting Beings within the chakra(s) for the 3rd, 4th, and 5th dimensional levels. A special price is available for download. If you would like to receive this information in your email as we provide it, please sign into our site and become a Subscriber. Journey of Illumination Create a free website or blog at WordPress.com.